We take many things for granted in the modern world. Sometimes it's good to step back from the computer to attempt to create something utterly normal, just to remind oneself how bloody hard it can be. I'm surrounded by a sea of paper - it covers my desk, lurks in piles on the floor and bookshelf, and eventually flows into a recycling box in the corner. Paper is something that I couldn't do without, but don't have a clue how to make. Let's fix that in Retro Thing's first-ever "Martha Moment." Fun Science Gallery features an excellent guide that leads you through the process of 'recycling' newsprint into a brand new sheet of heavy paper. You could also make the stuff from cloth and even bark, but that's more work than the gang at Retro Thing Labs is willing to invest. Where else do you get to play with a mortal and pestle, hairdryer and a sieve, apart from your local meth lab? What you do with the final product is up to you - I heartily recommend ransom notes, really heavy paper airplanes and doodle sheets. Heck, you could even add a piece of duct tape and create a homemade post-it note. OK, I'm done. I promise never to channel Martha Stewart again. 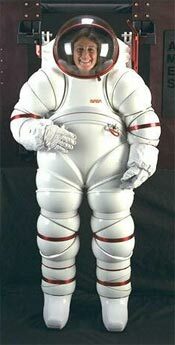 Lets face it, today's bulky space suits make you look like the Pilsbury Dough boy - hardly the way to get that cute diaper-wearing astronaut grrl to notice your fabulous gravity-free bod. 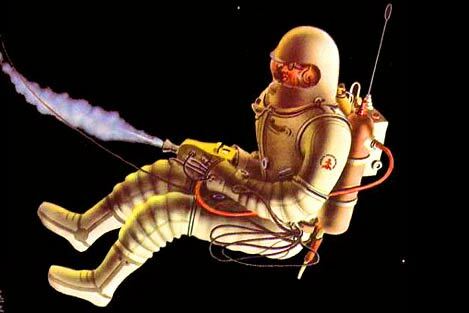 What the world needs is space suits like they used to draw in the good old days, before boring things like real world physics and down-to-earth budget constraints ruined everything. Atomic Rocket: Space Suits offers up pictures of dozens of imaginative designs that will ensure that you're the toast of every space station tailgate party. Just remember to follow the immortal words of Larry Niven in The Hole Man: "You don't leave your fly open in a pressure suit." Of course, things are much harder in the real world than on the pages of a science fiction novel. Faced with the challenge of producing safe equipment, NASA has created some extremely odd designs, like the awkward armored suit on the right. Still, there's hope: Modern technology promises to usher in an era of highly flexible and svelte space gear. All we have to do is avoid an accidental global nuclear war while the boffins do their thing. 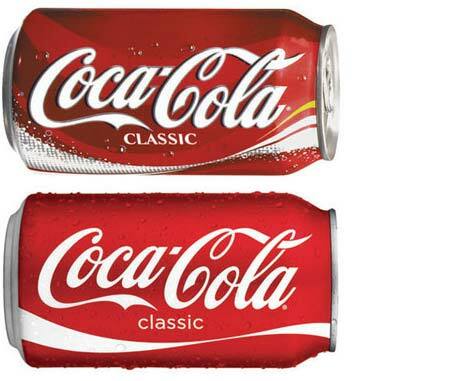 Allow me to present the new face of Coke. They've done away with the bubbles, splotches, drop shadows and odd yellow streaks. Simplicity is the new name of the game. It's almost as if their ad team was staring at the stark and elegant simplicity of their Apple Macs for a few uninspired hours before suddenly realizing: "Less is more!" Welcome back to 1971, guys! While we're on the topic, check out the USA Soda site for a few hundred vintage Coke can designs spanning more than six decades. I especially enjoy the instructions for opening a Non-Detachable Lift Top that started to appear in the mid seventies - so much more elegant than bashing the can against a rock. 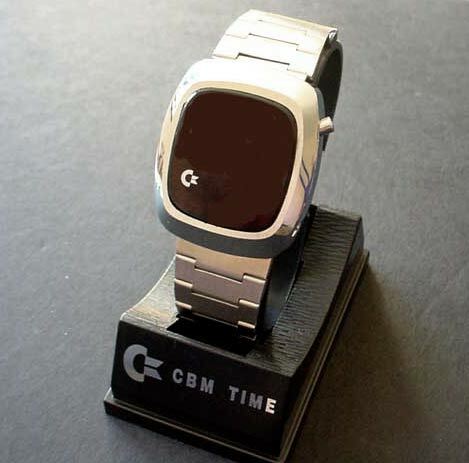 Anyone Looking For A 'New' Commodore LED Watch? Swedish retro watch site Retro World is selling a new old stock Commodore wristwatch that promises to become the jewel of someone's geeky timepiece collection. It, uh, shows the time when you press a button. Apart from that, you should be able to squeeze a few minutes of excitement out of opening and closing the clasp on the stainless steel strap. Oh, and it will display the date. 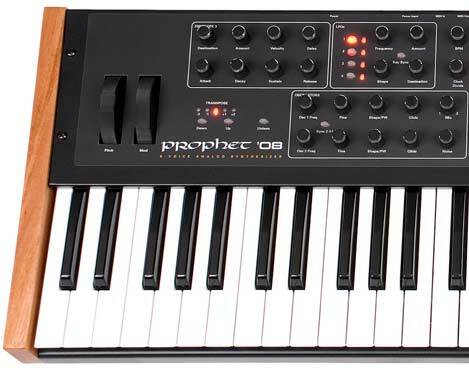 Back in the late 1970s, the distinctive sound of the Sequential Circuits Prophet 5 synthesizer graced nearly every pop album. 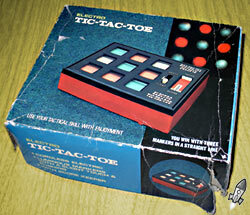 It was the first programmable polyphonic synth, capable of playing a whopping five notes simultaneously. It was also unbelievably expensive, retailing for almost five thousand dollars. Company founder Dave Smith released a range of groundbreaking instruments throughout the 1980s before jumping successfully into the world of software synthesis. The software market quickly became overcrowded, and he opened a new boutique synthesizer company called Dave Smith Instruments a few years later. His hybrid digital/analog Evolver series earned rave reviews, and everyone thought that a drum machine would be the next product to see the light of day. Handheld gaming is where it's at. The Nintendo DS outsells all other gaming consoles, and it's easy to see why: excellent games, a reasonable price and extreme portability. But not everyone wants the newest commercial games - some just want a top-notch portable platform that can emulate classic consoles and play modern hombrews. The Gamepark GP2X is your answer. We've mentioned this little Linux-based handheld in the past, and Gamepark just announced an eagerly awaited update. 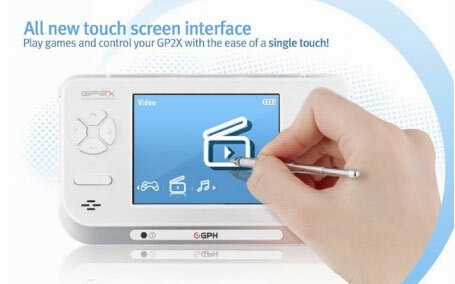 The new GP2X F-200 sports a brand new touchscreen interface and a much improved 8-way digital control pad to replace the annoying little control knob on the previous model. Apart from that, the big difference is the bright white case. Like its older siblings, it runs a portable version of the MAME arcade emulator that gives you access to thousands of vintage games. It'll also play a multitude of video formats. It's scheduled to arrive in October, no word yet on price. Two forty year-old all beef patties, special sauce, lettuce, cheese, pickles, onions on a sesame seed bun. It doesn't have quite the same ring as the original tongue twister. Still, I suspect that McDonald's Big Mac is older than most Retro Thing readers, including both Bohus and I. The fatty double-decker sandwich first appeared in 1967. It was the brainchild of Jim Delligatti, a McDonald's franchisee in Uniontown, Pennsylvania. It's distinctive center bun was added to hold the overly gooey concoction together. Over 500 million are sold each year in North America alone. 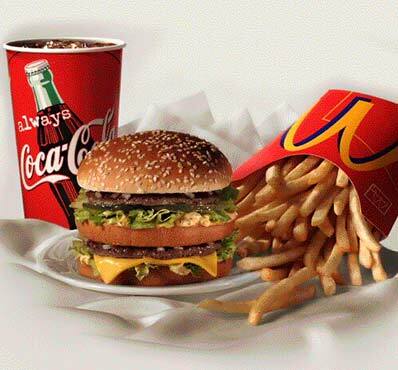 In some ways, the supersized Big Mac is the ancestor of the modern fast food industry -- what originally started out as an occasional treat has become a regular part of the American diet. Incidentally, 89 year-old Delligatti recently opened the McDonald's Big Mac Museum Restaurant, which features the world's largest Big Mac statue. I can feel my arteries constricting at the mere thought. Good thing I'm vegetarian! By the way, here's a recipe so you can create your own at home. It's not nearly as much fun as ordering one from the drive-thru at 1am and then paying in pennies. Oh, I've been meaning to tell you that I've become crushingly old in the last few days. 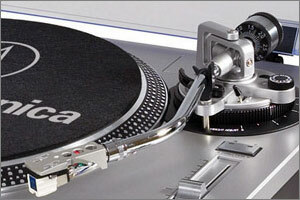 A friend of mine was bequeathed a turntable, and asked me to help hook it up. Once the dirty work was over, she was amazed that there were different songs on each side of the record, that you could put the stylus anywhere and instantly hear music, and that the tone arm would retract instead of "screwing up the sticker in the middle". Granted she's 20 years old, and so has no real frame of reference for these mysteriously musical shiny black discs. This led to talking of the days when "multimedia" actually meant multiple separate devices synchronized together to put on a show. Back when phones only made telephone calls, you'd need special machines in order to bring audio to visuals. 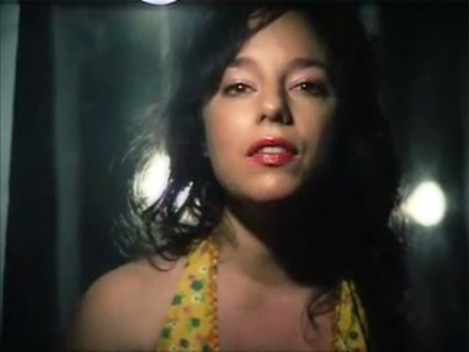 The Singer Caramate (yes, the sewing machine people), brings together a carousel slide projector, a cassette player, and a built-in screen. Clearly patterned after a (really heavy) portable television, you pop a carousel full of 35mm slides on top, snap a cassette in the side and hit "play". The projected image is better than HD resolution (I love saying that...), and is surprisingly compact given all that it's doing. I believe that this unit is also able to auto-advance the slides, controlled by inaudible tones on the cassette. These weren't really consumer devices. I saw them mostly in schools and in libraries. 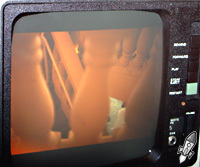 In addition to looking at commercially available slide shows, you could also create your own using a 35mm camera and the Caramate - much easier than trying to make your own educational filmstrip! Until video cassettes came along, this was probably the least expensive way of synchronizing a visual presentation with sound. These all-in-one viewers are still useful today if you have a lot of slides to sort through. It works even in room light, and this is much easier than setting up a screen and chasing everyone out of the room. While not actually "interplanetary" or "atomic", can you think of a better-looking way to crush ice either in outer space or in a fissionable state? Sometimes a high sense of design is most striking in an application where there's not much demand for design at all. Take the humble ice crusher for instance - not an appliance we see much of anymore, and when I have seen them they are often a bland affair. Like a mini-Norge fridge screwed into the wall. 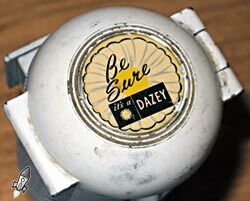 Enter the Dazey 160. Not only do it's multiple scary blades still make short work of ice cubes, it's housed in an unmistakable rocket shape. The late 40's brought with it an exuberant movement in design that fans call "Populuxe". With eyes on an optimistic future, consumer products were designed to look ready for that Jetsons push-button age that sadly never came. 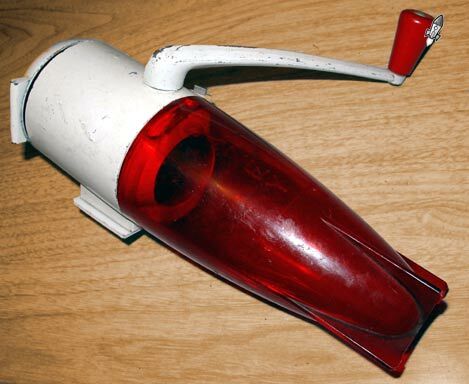 Even this little household appliance has daring curvaceous lines, a mix of heavy aluminum and rocket red plastic, and four fins... oh, the fins! The reason I don't have this up in my kitchen is that (besides having coped so long with ice in its naturally occurring uncrushed form) it's hard to have the rest of the room live up to the coolness of this one household implement. 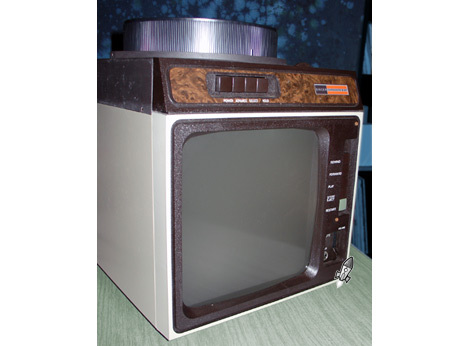 Maybe one day it'll inspire me to install a bubble shaped porthole in the kitchen, replace all the dinnerware with multi-colored aluminum & melamine, and finally put up that sputnik wallpaper - all because of a little ice crusher that looks ready to blast off! I found these large wooden gears at a thrift store not long ago. They're gorgeous and old, but I can't figure out anything more about them. As you can see, they're quite big. The gears above are roughly the same size as the back tire of my compact car. The large wheel in the grass below is smooth (maybe for use with a belt?) and about 2 feet across. 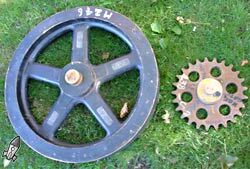 These look like they've seen some use, but don't seem sturdy enough to actually have been used in a large mechanical device. How did they get worn in this way? Also interesting is the writing on the sides. These look like they could be catalog numbers perhaps? 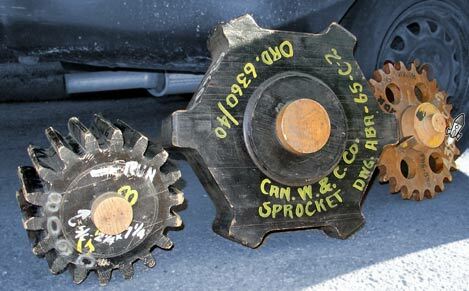 Like these were the example gears at the... uh... gear depot where you'd place your order? In-class science demonstration props? As a boy I remember accompanying my father to the marble cutting plant he worked with. They had ancient and massive machines for slowly (we're talking days) sawing through slabs of marble that were two stories high. The large saws had massive wooden flywheels and exposed parts much the size of these things, so these gears must have been intended for something very, very large. 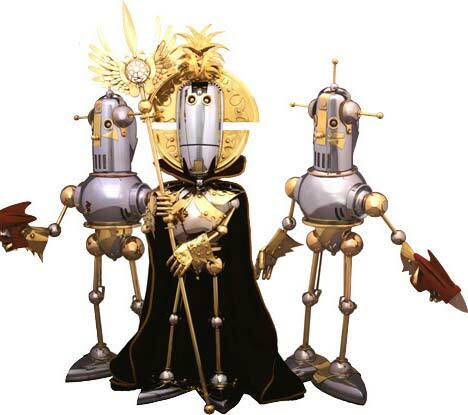 I'm calling out to all of you retro sleuths out there. The comments that you folks leave show that our readers have a lot of insight into a staggering number of different areas, so I'm hoping that some of you may have an idea of what these gears were used for. I love a mystery, but mostly I love a solved mystery. Click the "comments" link below to add your thoughts. A $2000 Retro Swatch Watch? Believe it. Swiss watchmakers ran into serious trouble in the 1970s. The nation had enjoyed decades as the world's preeminent source of wristwatches, but the world shifted dramatically with the introduction of high quality timepieces from Japan. It was suddenly fashionable to wear a wafer-thin Seiko with a quartz movement, and the arrival of digital LED and LCD watches made traditional mechanical movements seem quaint and inexplicably expensive. The Swiss fought back by creating the revolutionary Swatch. The first series of twelve Swatches were introduced in 1983 and rapidly took the world by storm because of their bold styling and affordability. It was suddenly possible to own a genuine Swiss-made watch for a mere 50 Swiss Francs. The company managed to make analog timepieces trendy once again by incorporating an ingeniously simplified mechanism within a precision made plastic shell. The Swatch Group gradually grew to encompass over a dozen brands including Omega, Longines, Tissot, and famed Swiss movement manufacturer ETA. The Swatch brand had its heyday in the late 1980s, and many people are starting to recognize the appeal of "retro" swatches. Squiggly Swatch Watches offers a fascinating assortment of brand new and new old stock vintage Swatches, although you should expect to pay as much as 1400 euros for a rare 1983 "new in box" model. Slightly more common designs from the early 1990s sell for around 50 euros. Francesco from the Italian GAMERS magazine recently let us know about Italian retrogame guru Madrigal, who created the very first Nintendo Game & Watch simulator a few years ago. 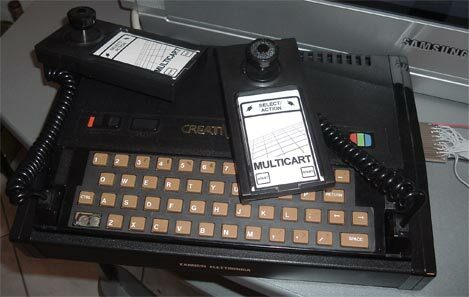 He's back with the first (and only) multi game cartridge for the 1980s Vtech CreatiVision console. 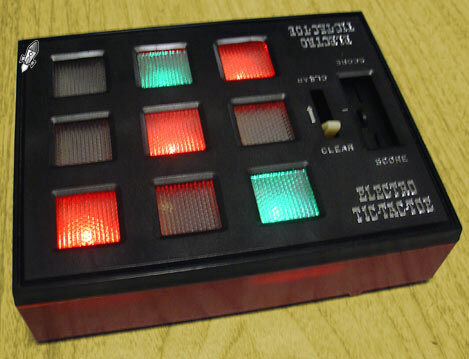 The CreatiVision was a 6502-based hybrid video game/computer console introduced in 1981. It was mainly distributed in Europe, although a somewhat rare NTSC version made its way to North America. The machine's specifications were quite respectable for the day: 256 x 192 pixel resolution with 16 colors and 32 sprites, 3 channel sound, and a pair of joystick/membrane pad controllers. There was even a rubber keyboard (shown above) that worked in conjunction with a BASIC programming cartridge and cassette interface to turn the system into a full-fledged home computer. A limited edition of 100 multicarts will be produced, retailing for a quite reasonable $57.95 / €42.95. The package includes a deluxe full color box with internal cartridge holder and a 12 page booklet with instructions for each of the games. The 8 megabit EPROM includes 25 games (and three versions of BASIC), chosen with an onboard 5-way DIP selector switch. It even comes with 6 cardboard joystick overlays. All in all, this looks like a truly polished homebrew effort.